Provenance: I saw the video of the title track being torn apart on Beavis and Butthead. I knew right away that I needed the album. Review: Aside from NWOBHM die-hards who may have bought this the first time around, I imagine the majority of people alert to the charms of Grim Reaper were introduced via Mike Judge's finest creation to date. As a way of announcing yourself it was hard to beat. You see, the video to 'Fear No Evil' was truly something to behold. Amazingly, given that the budget for recording the album must have been no more than six or seven quid, Grim Reaper somehow sourced an amphibious landing craft for the opening shot. Sailing up what appears to be the Aylesbury stretch of the Grand Union Canal at 4am in the morning, you half expect to see some poor carp angler hunched over his keepnet as the heavy metal juggernaut chugs past. Grim Reaper then reach their destination (a warehouse) where a man in a bad Hallowe'en mask has captured about eight spotty headbangers (i.e., Grim Reaper's entire fan base) and put them to work grinding corn. The band, taking umbrage at this ghoulish welfare-to-work scheme, set about liberating the callow youths using the power of metal alone. The only real shame is that GR didn't don any masks or hoods themselves as they are spectacularly unsuited for the video medium, least of all the wonderfully-monikered lead-screamer Steve Grimmett. So, what of the music? It's...fantastic. Genuinely. The only misstep, musically speaking, is the laboured and unfunny introduction to 'Final Scream'. Not only does it jar by trying to introduce a note of humour, it also kills the momentum stone dead. The rest of the album, until that point, had been nothing more than some of the most wild-eyed, hysterical metal committed to tape. The intro to 'Final Scream' brings it all stuttering to a halt and the track, one of the album's weakest, never quite reclaims the lost territory. If it seems like I'm labouring the point, it's because the rest of the album is so endearingly insane. Grimmett sounds like Rob Halford after electro-shock therapy; I can't make any useful comparison in terms of tone, however, because whilst Halford regularly dips into his rich mid-range Grimmett seems to be on a personal crusade to belt out every note as if it were his last. Even through the rickety production, the power of the Grimmet pipes is evident, as is guitarist Nick Bowcott's dexterity. How do they fare on the ballads? There are no ballads. That's not to say that it isn't derivative; it is. Almost every heavy metal cliche in the book is ticked off, then revisited again - and again - but it's done with such aplomb and sincerity that you want to believe that thunder will roar, that fights will be carried to the end that what you're hearing is genuine, one-hundred percent proof red hot rock 'n' roll. As you can probably tell, the lyrics could've easily been written in crayon - nobody is going to confuse the Grimmett/Bowcott partnership with Lennon/McCartney or David/Bacharach in a hurry, but nor would they wish to. Glorious stuff. 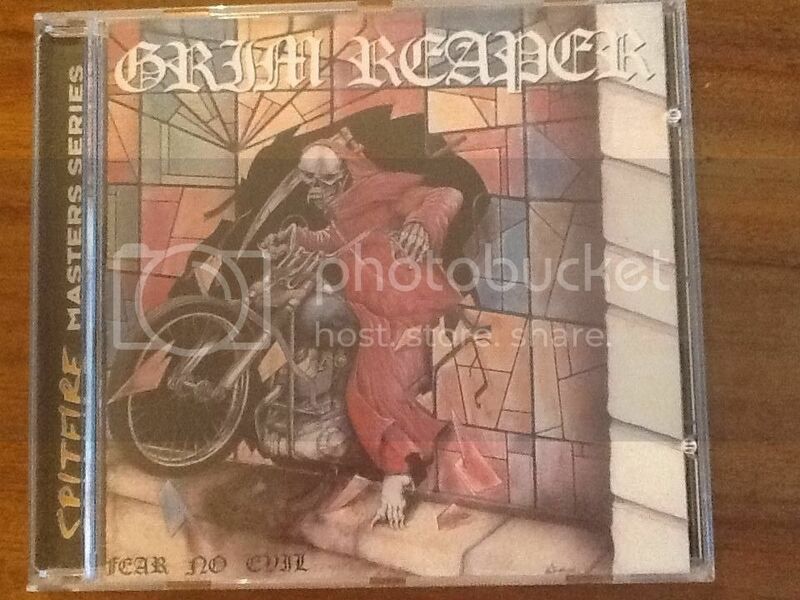 Grim Reaper were never in the first rank, or even second rank of British metal bands. It doesn't matter; this is one of those albums where you can hear the sweat pouring out of the speakers. So, are we left with nothing more than a quixotic triumph of perspiration over inspiration? Not a chance; this is fine, fine metal music made with passion and, dare I say it, love. A while ago my partner suggested that I should do something with my album collection. I chose to ignore 'throw it in the trash' and instead plumped for reviewing every CD I own. I have no idea quite how many CDs I have, nor am I of a disposition to care. All I know is that month on month the number grows whilst our apartment remains the same size. What do I want out of this? Fundamentally, I want to enthuse people about music. I'm not solely talking about the music I love (though that would be great), but for readers to think of music as more than just a statement or something to be traded off as cultural capital. Sit back and enjoy, or bang your head furiously - I'll be doing one or the other.